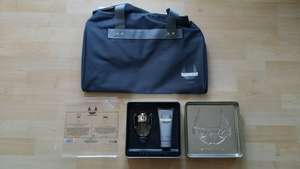 Paco Rabanne Invictus 50ml Eau de Toilette Gift Set. Also when you purchase any Paco Rabanne fragrance you get a free bag. All for £20!! Even the women behind the till couldn't believe it as the 50ml bottle alone is just under £40 I think. It's also a great fragrance which I got last month so grab yourself an early Xmas present haha. I think they mean in store. They had about 20 in the Basingstoke store. is this offer still on? where can I get one? basingstoke abit far for me. This set has been taken off the website now, so doesnt look like they will be getting anymore...gutted i didnt order one!! plenty in Southampton, above bar store. didn't see any bags thou..
gone back up to full price now. .
Seen the ultraviolet 50ml gift set in supwrdrug Morpeth for £18. Lass put it through and till price was £37. She asked for help and a miserable trout came out,did not look at me told the girl to put it under the counter with £18 tag. I asked her why, and she started to walk away. She then said it was withdrawn from sale. I said so you wont sell it for the larger price, and off she went. Phoned customer service, and they backed her up. Well we shop there a lot, but no more. All for the sake of £19. Twitter and facebook here I come!